Roland Garros 2013 - Who are the Contenders? With the draw for the 2013 French Open released today, the potential semi final permutations have begun. The most interesting fact out of the draw is that defending champion Rafael Nadal and world number one Novak Djokovic are in the same half. If they can negotiate against their other opponents, they will meet each other in the semi final stage. This sets up an enticing encounter, and one that many felt would turn out to be the final. One person who wins from this draw is Roger Federer, as he does not have to worry about facing the absent Andy Murray. If you can get your hands on French Open tennis tickets, you will get the chance to see some of the best players in the world compete for the year's second grand slam title. Before the draw, Djokovic and Nadal were the favourites to contest the French Open title on the last Sunday of the event. However, Roger Federer has got to be the man to beat now, as he will have a relatively easy passage to the final. Federer will have to be wary of a potential semi final clash against David Ferrer or Thomas Beyrdich. However, these are two players who he has not had a problem beating in the past. Federer would have to be seriously off his game for him to not make the final at the Philippe Chatrier Court. For Nadal and Djokovic, the draw represents a real chance to face each other sooner than they expected. Nadal has only lost one match at Roland Garros in his career, to Robin Soderling two years ago. However, he has lost eight out of his last eleven games against Djokovic, including a final on clay in Monte Carlo. This will pray on Nadal's mind, especially as he lost two grand slam finals to Djokovic recently: at Wimbledon and the US Open. However, Roland Garros is another ball game. Just like Roger Federer seems to gain super powers at Wimbledon, the French Open is Nadal's back yard. He has been next to invincible on this court, often leaving his opponents with no chance. There was a final a few years back where he beat Roger Federer in three sets, winning one of the sets 6-0. From Federer's point of view, just getting to the final will be an accomplishment. He is the third ranked player in the world, but that is only because Nadal has been absent through injury. If Nadal continues his stunning form for another six months, Federer would surely drop to fourth in the world. He still has that magic touch in certain games, but no longer has the fitness levels to sustain success in various tournaments. Long clay court matches will certainly test him physically, but the draw will play to his advantage. 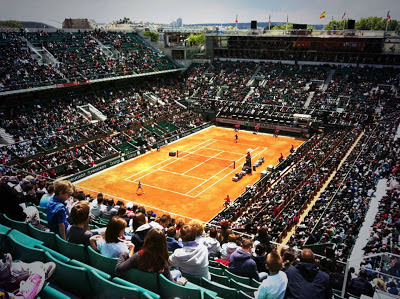 There are many available tickets for this year's French Open. There are tickets for the early stages, where you can visit all the courts and experience the atmosphere of a grand slam. While Nadal and Djokovic will have a gruelling semi final to look forward to, Federer's matches will be a lot shorter. This should leave him with plenty of energy in the tank for the final, should he make it that far. It would not be unreasonable to think that Roger Federer is now the favourite to win this year's French Open title.